ROME – The world of the Turkish khanqahs of the Ottoman empire will be on display in an exhibition numbering some 350 objects at the Galleria delle Cinque Lune. In partnership with the gallery the Turkish Cultural office of Rome are putting on the exhibition, which was due to open on Oct. 16 at 6pm. On show will be 350 artefacts, principally of religious or everyday use. They originally came from khanqah buildings, residences which appear across the Islamic world. Khanqahs served as meeting places for members of the Sufi brotherhood, as well as hospices and places of spiritual retreat. They are still used, to a lesser extent, today. Amongst the items on display are various misbaha (rosaries), candlesticks, ancient calligraphy, paintings, lecterns, incense burners, compasses, jewellery etc. Through these items are illustrated the historic links between Islamic Sufism, or the inner, mystical dimension of Islam, and Turkish traditions. 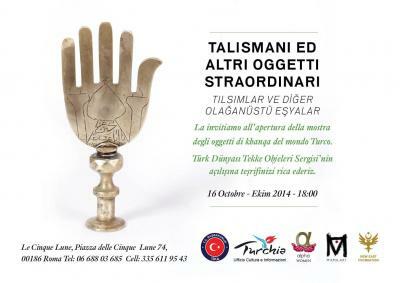 The “Exhibition of talismans and other extraordinary objects” will open Thursday Oct. 16, at 6pm, at the Galleria delle Cinque Lune, Piazza delle Cinque Lune, 74.